Designing your Landscape is one of the most important aspects of the landscaping process. It is very important to make sure the various landscaping components will not only be visually appealing but will be practical for you and your family. We work with the best designers in the business and have various designer options depending on what your requirements are. 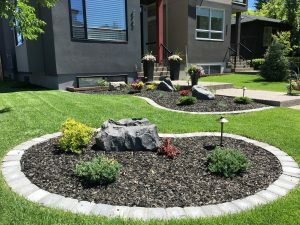 DO YOU NEED A LANDSCAPE DESIGN? About 70% of the landscapes we build are installed without a formal, to scale landscape design. These projects are often smaller landscaping jobs that do not require an extensive design and many of the projects are single components jobs like patios and walkways or make overs for garden beds. Before we begin any project we spray out all of the key areas on the ground. This gives our clients a great first look at how the various landscaping components will be laid out. If you have a more extensive project with numerous landscaping components then you may want to consider a landscape design. A landscape design will give you a great visual look at the layout of your landscaping project. 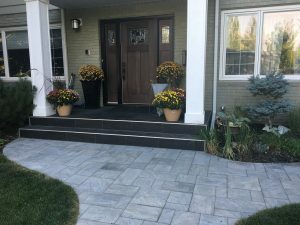 It will also identify plantings including trees and shrubs as well as hardscaping such as patios and walkways, fences and decks and other landscaping components. If you choose to have a landscape design created for your project it will definitely make the estimating process easier for your contractor. Having one landscape design will mean you can obtain accurate estimates from various contractors. This means that all the landscaping contractors will be estimating on the same landscaping components including the type of material being used and the dimensions of each component. We find that a design really helps our clients identify the exact landscaping components they require and the end result is accurate estimates from all landscaping contractors. We understand that your property is a big investment and we want our customers to know that we are there for them to help them accomplish the dreams that they may have for there property. During our initial phone conversation we can discuss your landscape design requirements and help you decide if a design is best for your property. We will also be happy to visit your home and walkthrough your property with you. This initial walkthrough will give us insight as to whether you would benefit from a landscape design. Add curb appeal and value to your property. If you decide to install your landscaping with Chinook we will deduct the cost of your design.